Behind Green Eyes: My last ever e.l.f Haul! 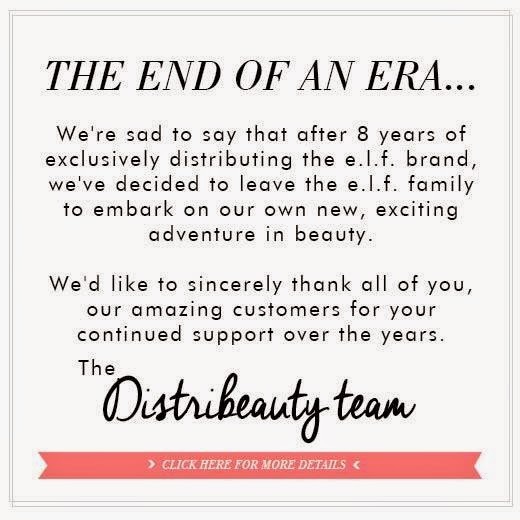 They're currently in the process of selling off all remaining e.l.f stock on the site, and handing over the running of their social media accounts to the US team. What does this mean for us? Well, we're not quite sure yet. Currently, the U.S site doesn't ship internationally. Whether or not they decide to change this will be at their discretion. You can keep an eye on the UK facebook page for information over the coming weeks and months, but if you want to follow the Distribeauty crew in their new venture, you can find their new site here: Beauty Crowd. Right! Back to the matter at hand. I ordered ten items in the sale. Including a shipping fee of €5.44, the total should have been €57.65. Because of the sale, the total was €32.03 - meaning that little lot in the photo came in at just €26.59 less shipping. Pretty nice discount! The single eyeshadow is nothing special - it's a standard burgundy eyeshadow that applies well and isn't chalky. The lustrous eyeshadows were really hard to photograph - Gala is a warmer toned shade, while Festivity is cooler. Both reminded me of the Chanel Illusion d'Ombre eyeshadows texture wise, they're quite spongey and springy and have several tiny particles of shimmer. Payoff is okay, not as good as you'd get from a higher brand, but they lasted well and didn't crease. L-R: Rasberry Truffle, Gala, Festivity. I have a couple of backups of my favourite Essence eye primer, but this is definitely a winning formula too - it's creamy, a little goes a long way, and it makes a huge difference. The left swipe is Raspberry Truffle without primer. The right swipe is the same shade over primer - it really brought out the burgundy in the shadow and made it so much more vibrant. Sleek Rose Gold does that too - the coral gets lost on me and I light up like a Christmas tree. It's a shame, because it's a lovely coral colour, but I'll be saving this one for the next time I use fake tan. I've never tried a mascara primer before (unless you count the white end of the Bourjois Coup de Theatre in the early 2000s) so I was looking forward to this. It goes on white and dries very fast. I have a swatch - I think it made an enormous difference and I'll definitely be trying this under other mascaras. In the picture below, I used one coat of Benefit's Rollerlash, with primer on the left and none on the right. I love the packaging on these lipsticks - very NARS-like. This one is a rosy brick brown shade, which I really like. The formula is really creamy, and the lipstick has great staying power. Nothing that a quick snip didn't fix, but still - very annoying. Here's a look at the two colours, Muted Mauve is on top and Ballet Slippers is on the bottom. I have a couple of the polishes from the old range - and they're awful. Whatever they did to change the formula really worked well, because this was great - that's just one coat on the colour wheel, it's a lovely smooth polish to apply that levelled out really quickly and dried within minutes. I'll be sad to see the UK site going - hopefully another distribution company will pick the brand up. Firstly, what beautiful eyes you have, so green:) The mascara primer and eyeshadow primer both sound great! I didn't hear anything about the news from ELF, it's a pity! Great haul! Love that lippie. Love the color and coverage. I hope elf stays in Europe, I don't understand why would they leave even though they have more competition now with MUA and MUR. Ah, it's a sad aul day! I wonder if the distributor will do something similar, or if ELF will be taken over by a new company.